I really dont know if anyone has ever heard, come across or eaten the fruit Dates. Well i must say its the sweetest fruit i have ever eaten or will i say the sweetest fruit that ever existed without exaggerating, for anyone who has tasted it you sure do know how sweet it is. But to be precise Dates is far more beyond its sweetness as it has other specific important good attributes which is extremely good for the body. At first when i ate it i taught and said to myself that the fruit was far way too much sweet and isnt health wise to be eaten all the time as the sugar content is relatively high thinking it could lead to diabetes. Well Dates isnt like that at all infact it has no side effect no matter how much you eat it. 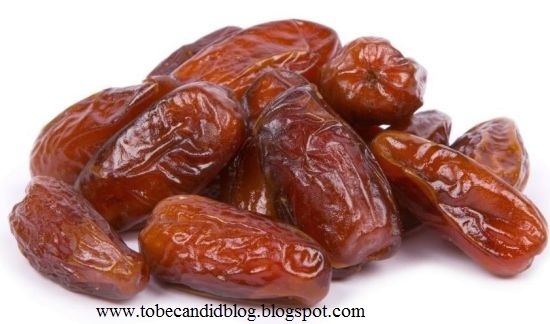 for people who love sweet things i bet Dates will be good for you as it adds other attributes to your body medically instead of junks that will diminish the body at a fast rate. Dates is a fruit thats almond like but its not, some people eat it with milk some with yoghurt it depends but i prefer eating it like that. it is sometimes dried infact most times dried but still so sweet when eaten and works for the body in a great way. Dates is rich in several vitamins and minerals which is good for the body including fiber, it contains oil, calcium,sulfur, iron, potassium etc which are beneficial to health. 1. Dates prevent weight loss which means for someone whos just medically getting better or has reduced in weight or lean due to stress or discomfort taking Dates is the best as it increases weight.